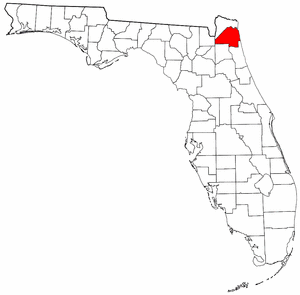 Duval County was created in 1822. It was named for William Pope DuVal, Territorial Governor of Florida from 1822 to 1834. When Duval County was created (on the same day as Jackson County) it covered a massive area, from the Suwannee River on the west to a line running from Jacksonville to the mouth of the Suwannee River on the east. On October 1, 1968, the government of Duval County was consolidated with the government of the City of Jacksonville, although the Duval County cities of Atlantic Beach, Baldwin, Jacksonville Beach, and Neptune Beach are not included in the corporate limits of Jacksonville, and maintain their own municipal governments. In the early 1990s these three beach cities considered separating from Duval and forming Ocean County, an idea that had been kicking around since consolidation, but after the 1995 election of Jacksonville mayor John Delaney, a resident and former Mayor of Neptune Beach, the idea was dropped for good. Monthly magazine dedicated to area entertainment and events. Offers local news and national coverage. North Florida's raddest TV show since 1988. Profiles of hot surfers, board builders, top skateboarders, and other radical people. Comprehensive news for Northeast Florida and Southeast Georgia. Bi-monthly journal reflecting life in the Coastal South. Visitors information television network viewed in the Jacksonville International Airport and hotels.